My fragrance these days, ‘eau de chlorine’ ;) Here you’ll find everything to do with swimming as part of my triathlon training. 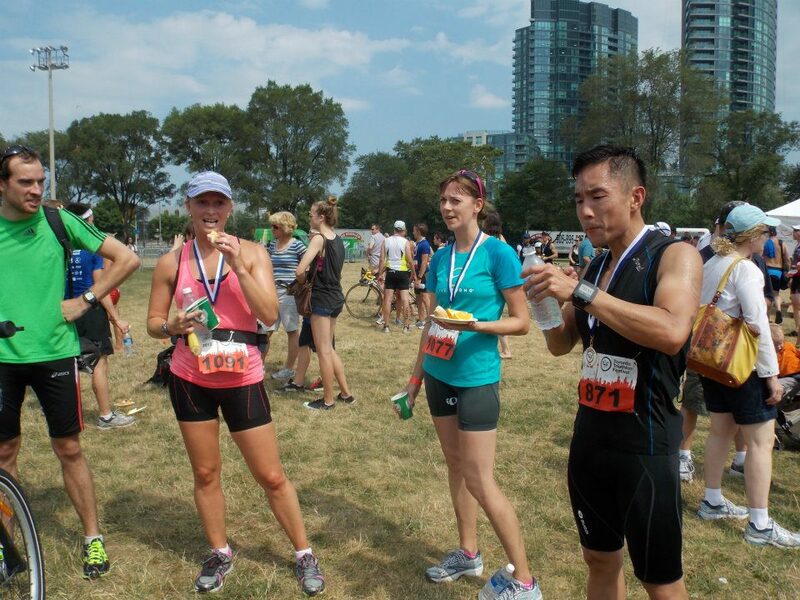 After 2 months of training and making my first serious commitment to triathlons I completed my goal race, the sprint distance in the Toronto Triathlon Festival. 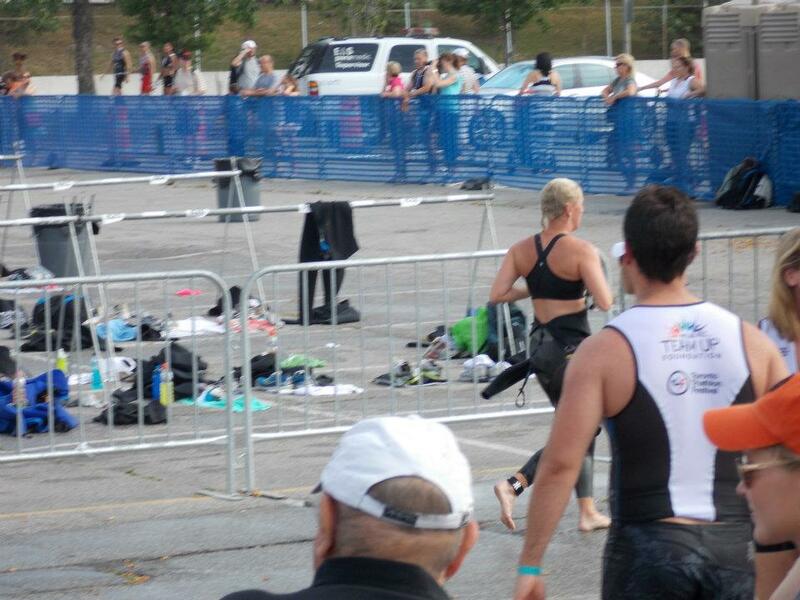 For those who don’t know, that’s 750m swim, 20km bike, and 5km run – my longest triathlon to date. I woke up (6:45am) and for the fourth day in a row with a stiff neck -yes, I know it’s likely my pillow. So I stretched and went through my typical race day routine (fueling, praying, stretching), and got on the road with my friend Jenna who was also racing – it’s now 7:45am. 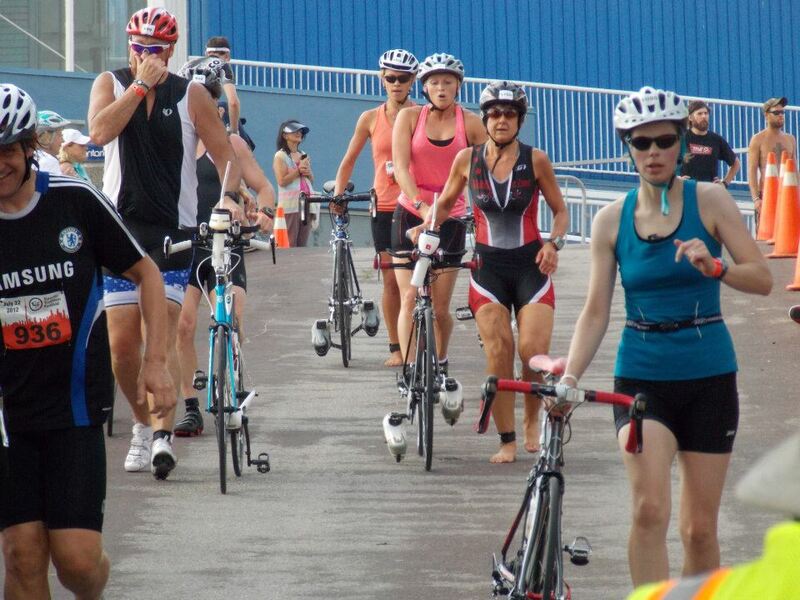 While riding to the transition zone we were able to catch Canadian Olympian and flag bearer for the 2012 Summer Olympics, Simon Whitfield, as well as Paula Findlay finish their races – very motivating and inspiring. 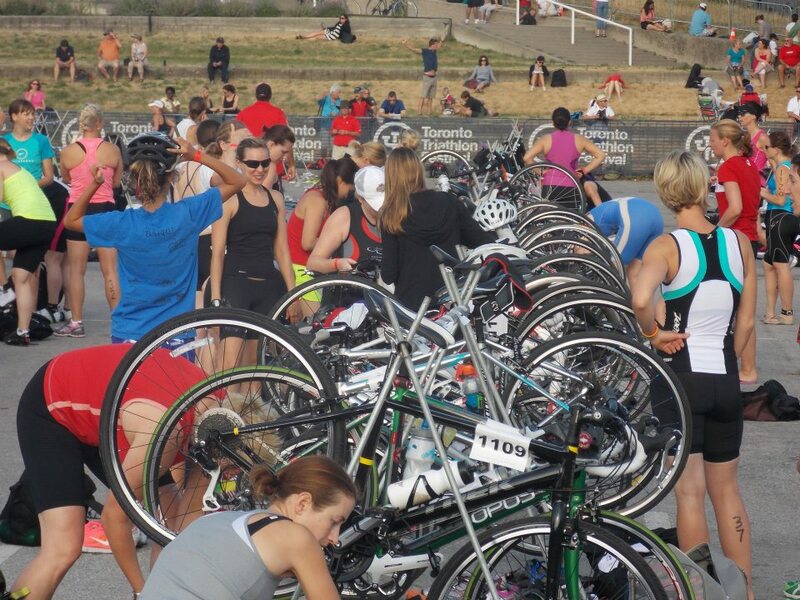 The Tor onto Triathlon Festival has been an amazingly well organized race. From the race kick off Fun Run sponsered by Porter Airlines (they gave away 5 flights) and Training Mobs who captured all the fun on camera, to the mandatory race briefings, to all components of race day, all aspects of the race were thoughtfully planned. When we arrived, the Olympic distance had already begun. We set up our bikes and our gear in our designated spots (so well organized) and listened to the hilarities that were being mc’d by our friend (and race organizer) Travis, and watched for our friend Julien, who was racing the Olympic. 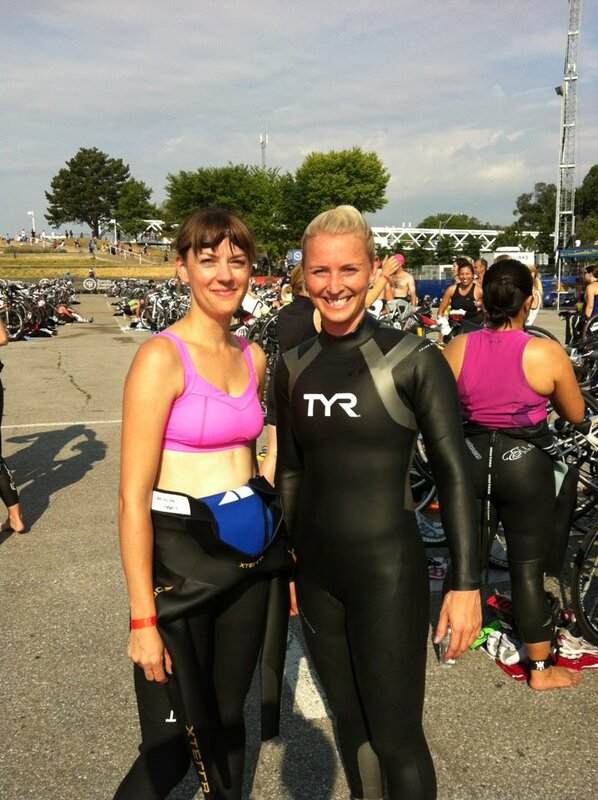 At 9:00am we were in our wetsuits and waiting to race. It was already above 25 degrees, so in neck to ankle wetsuits we were roasting! We cheered on our friend Vince who with his brother Victor started the Sprint at the first wave at 9:30am. Eventually it was our turn and we were treading water during the in water start. The horn blasted and we were off. This is only my third Tri of the season and the open water swim has been my biggest challenge, not because I don’t know how to swim, but because of the mind games I have been playing. In order to prep for this race, I integrated more open water swims, 3 more than any other race this season, and I feel it worked. The horn went off, I had positioned myself in a great spot to the left of the group and I followed my sisters Iron Man tactic of 20 head up strokes to get acclimatised to the water and the race. I made the first two left turns, and on the l ong straight away, with lots of open space, gave in to my speedy stroke and rolled over and started swimming back crawl – I laugh as I type this because it is so silly. Now you can swim anyway you want – that’s in the rules, and while back stroke isn’t ideal, it’s my fastest racing stroke, so I felt confident in my space and just took off. I was calm and relaxed and watched all of the other green caps as I raced passed, and 15min later (and in 4th place) I finished the swim, climbed the stairs out of the channel and started to strip the wetsuit off. I found my bike – row 2, although I actually ran to row 3 first – and sat down to rip my suit off. This has become my new habit, after struggling my first race to remove the suit, from then on I just sit down and get it done. The bike leg had a huge transition to the mount line. It was up a hill and on a bridge to cross the Gardiner expressway. The bike leg definitely felt like a challenge, it ended up being my slowest leg – again. It was full of slight inclines and declines and a headwind. A couple training rides ago I finally got my bike computer working, so was glad it decided to work today and I could see my pace. I tried to keep it as close to 30kmph, my race results had me at 28.7kmph. I was happy to see my fellow lululemon’s along the way, hearing Sam shout encouragements, as well as seeing fellow Queen St. Ambassador Vince when I had only 5km left. The husband also appeared along the route cheering after walking up the Gardiner off ramp – definitely a surprise to see him standing on the off ramp median cheering. I soon found myself back to the dismount line and with burning legs, had to run down the hill. This part was a challenge as my legs were on fire and were feeling very heavy. My dad and Aunt Care were cheering at the bottom of the hill and it pushed me forward to the final 5km run. With a quick transition the running shoes were on. I decided to grab my hydration belt because by this time of day it was HOT out. I took a gel, grabbed my Nike+, and hat. With the hat on and gel eaten I was no longer holding my Nike+ (not good as it had my 2010 NYC Marathon band) but I kept running, now no longer knowing my pace (and those who know me, know I’m a gear nut, so this was going to be a challenge). With more mc’d support from Travis I exited the transition zone and started the run. I fueled at most stations, or opted to dump the water into my hat (a trick I learned from my grade 6 male students). Near the 2.5km mark I had a huge energy boost brought on by my Queen St. Lululemon family who were hosting the cheer station. It was great seeing their smiling faces and hearing their encouragements, it made me feel like I was an Olympian ready for London. After the half way turn I was headed home – nearly literally as we were running along the Blue Water Martin Goodman Trail, a trail I run daily and often refer to as “my backyard” – to the point where I even said to myself while running that I wasn’t going to let anyone beat me in my own backyard. So I pushed on, through the fatigue and heavy legs and headed to the finish line. With only 1km left, I started to feel really drained and decided the best thing to do was give thanks. And so I continued to thank every volunteer I passed and began to list in my head my top 10 list of things I am grateful for (family, friends, fitness and couldn’t seem to get over those three items, so kept repeating them in my head). With only 300m I was happy to see Julit cheering me to the finish, friends Tammy and Lisa who came out to help me “bring it home” and my family standing and cheering along the chute. I got a personal be st and am happy to say an 8th overall finish for my division. It was a great day, a great race, and I am so thankful for the love and support of my family and friends who not only supported me through my months of training but through my race day. 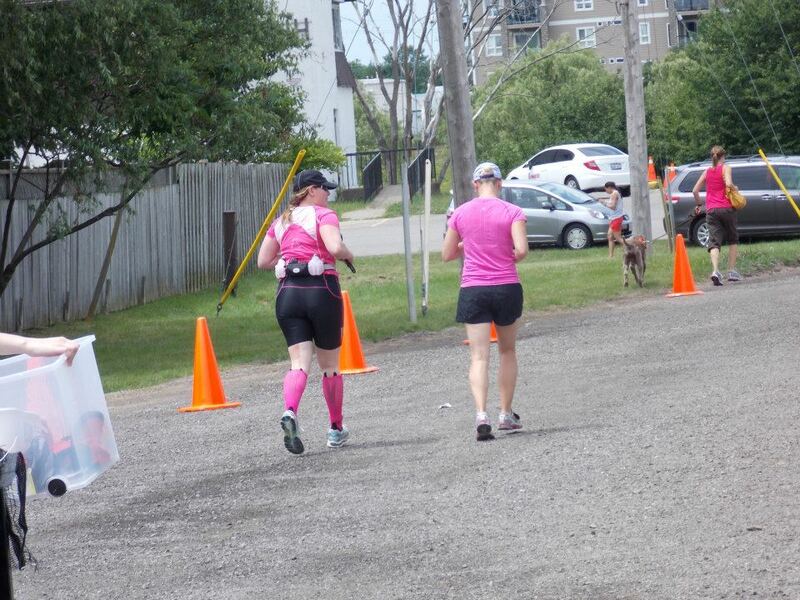 Yesterday was the Welland Half Iron Distance Triathlon and I had the honour of being my sister’s support team as she took on this challenge for the first time. 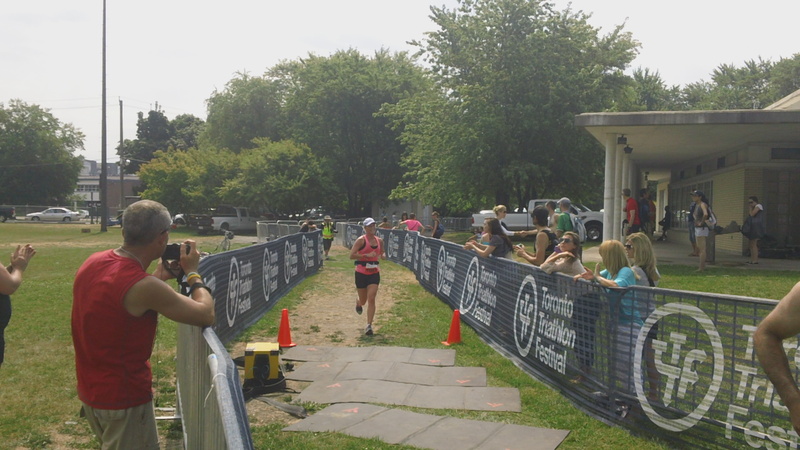 Sub 7 hours, she rocked it and I was so glad to be there. While supporting her during her half marathon distance run I spoke with another cheer supporter who commented how the “tough part is nearly over”. As a marathon runner, I corrected her, that the tough part was over yesterday, the training, and today was all the celebration and reward. The months of hard work was paying off with an amazing race – and my sister had just that. My sister is an inspiring and dedicated athlete and it was amazing to be there with her on this journey. Starting in August together we will be training for our marathon, NYC. It was our first and I’m looking forward to not only the 4 month preparation, but the celebration as we take on NYC together again.